Chinasa Ogbuagu in Sojourners. Photo by Chasi Annexy. 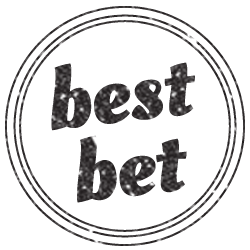 BOTTOM LINE: Make a date with The Playwrights Realm for some of the best acting you’ll see all year. That is the question at the heart of Mfoniso Udofia’s stirring new play Sojourners, now playing through February 13th at the Peter Jay Sharp Theater at Playwrights Horizons. Udofia, recipient of The Playwrights Realm’s 2016 Page One Residency, could not have asked for a better world premiere production of her exploration of immigration, assimilation, and cultural identity. A first-generation Nigerian-American herself, Udofia turns her practiced eye on the timeless story of an immigrant woman’s struggle to maintain her identity and forge a future in her strange new homeland. 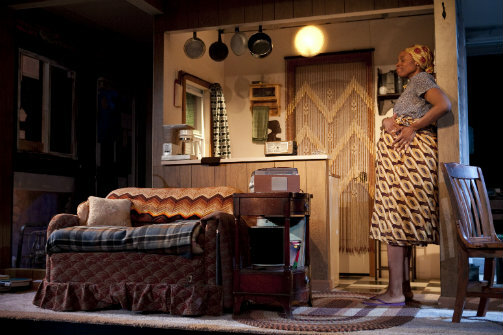 The play begins in the conjoined kitchen and living room of a modest apartment decorated with African art. The year is 1978—a Dolly Parton song plays on the radio as a very pregnant Nigerian woman, Abasiama (Chinasa Ogbuagu), sings beautifully in a foreign tongue to her unborn child. The child is restless and its mother is clearly in pain. After some food and further singing, Abasiama manages to calm her baby down just in time for her husband Ukpong (Hubert Point-Du Jour) to arrive home. It is immediately apparent that Ukpong is the vivacious opposite of Abasiama. He bursts in on fire to tell Abasiama about a rally he has just attended in their new hometown of Houston, Texas. He heard about it on the radio, he tells her, and there were all kinds of people there—black, white, Asian—celebrating peace and love and all that could someday be good with the world. Abasiama is unimpressed with Ukpong’s enthusiasm—she wishes he would stay at home and study for his classes at Texas Southern University, where they are both enrolled. Academics are far from Ukpong’s mind, as he has wholly embraced his new American lifestyle, drinking beer and listening to his favorite Motown records. Comparatively, the sober Abasiama is still living in Nigeria—she clings to her favorite foods, edikong ikong soup and fufu (the Americanized version of the latter made with Bisquick) and disdains Smokey Robinson and his ilk. Even their outfits (brilliantly selected by costume designer Loren Shaw) serve to highlight their contrasting worldviews. Abasiama is clad in a flowing skirt and patterned headscarf while Ukpong struts around in tight jeans and a colorful leather jacket. Though the couple shares some tender moments, it is clear that theirs is a marriage of convenience, and there are ominous signs of trouble in paradise. We next see Abasiama at the gas station where, despite her ever-advancing pregnancy, she continues to work. Here, she meets Moxie (Lakisha Michelle May), an illiterate teenage prostitute whom Abasiama attempts to help get a job at the station. Abasiama becomes a friend to Moxie, perhaps the best friend the young woman has ever known. When things between her and Ukpong come to a head, and a mysterious man named Disciple (Chinaza Uche) comes into the picture, Abasiama must decide whom to trust, and whether she can make it on her own. From the moment the lights come up, Sojourners is a transporting experience. It paints a vivid picture of a specific time in both United States and Nigerian history, a time when many Nigerians, some in arranged marriages, left their war-torn home country for the promise of cheap education and a better life in America. Udofia’s writing makes plain the anxiety of the immigrant experience, especially that of a woman coming from a male-dominated culture and attempting to make it on her own. Aided by Jason Sherwood’s versatile and intimate rotating set, Ed Sylvanus Iskandar directs his actors expertly, constructing breathtaking stage pictures and mining much-needed comedy from the heavy fare. Speaking of those actors...they are simply superb. I would put this ensemble up against any in New York— you won’t find a quartet of performers more perfectly suited to their roles. Hubert Point-Du Jour, completely unrecognizable from when I last saw him in Kate Benson’s Obie-winning A Beautiful Day in November on the Banks of the Greatest of the Great Lakes, charms as the hedonistic Ukpong, almost making the audience forget his character’s failures as a husband and father. Lakisha Michelle May spits fire as the jive-talkin Moxie, ensuring the play’s funniest character lives up to her courageous name. Chinaza Uche is exquisitely creepy as the deeply religious (and also appropriately named) Disciple, leaving uncertain his character’s intentions until the last. And Chinasa Ogbuagu, the heart and soul of the play, wows as the resolute Abasiama, gracefully guiding her character through an ocean of pain and confusion. Though Point-Du Jour, May, and Uche are phenomenal in their roles, they are merely tools to exacerbate Abasiama’s isolation, a feeling that Ogbuagu makes all too real for the audience. At the end of the day, Sojourners is Abasiama’s story, and Abasiama is always alone. She is a stranger in a strange land, trying to balance work and family while surrounded by men and women whose agendas are unclear. Loneliness, one might say, is the engine of Udofia’s play—it drives Abasiama to encounter her life in new ways, freeing her from some restraints only to present her with ever more. Sojourners beautifully illustrates an immigrant’s catch-22: rely on yourself and lose others, or rely on others and lose yourself. I dare not spoil Abasiama’s final decision, that is for you to see for yourself. And see it you should. You won’t be disappointed. Sojourners is written by Mfoniso Udofia and directed by Ed Sylvanus Iskandar. It is produced by The Playwrights Realm. Scenic design is by Jason Sherwood. Lighting design is by Jiyoun Chang. Costume design is by Loren Shaw. Sound design is by Jeremy S. Bloom. Stage manager is Kara Kaufman. The cast is Chinasa Ogbuagu, Hubert Point-Du Jour, Lakisha Michelle May, and Chinaza Uche.